Hi everyone - first post from this newbie, so go easy on me ! 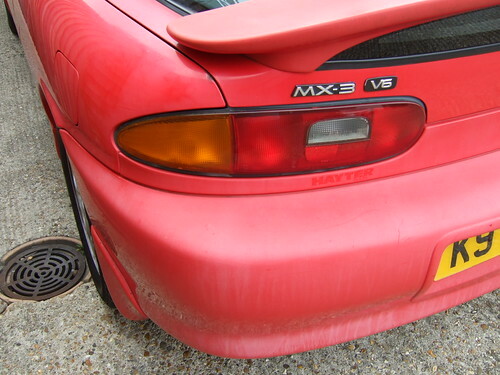 I joined the mx-3 world on Monday this week when I picked up a '93 V6, in red, for a snip. She looks in a sorry state though as the paintwork is very faded, the rear bumper is showing signs of paint loss, the mirrors have changed colour and the front bumper is peeling. Mechanically she's sound with only 53k on the clock (verified through service history) and some recently replaced consumables (tyres, battery, exhaust etc). the ABS light comes on at ignition, goes off on start up, but one of the front wheels locks when anchors are slammed on (quiet road to test). Any ideas what this could be - fault sensor? 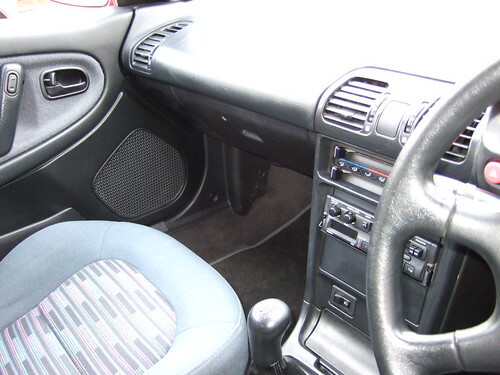 the window seals all seem a bit random in their fitment - especially round the mirror mountings. Many will need sealant to make them hold firm. Is this common or just on older models? I have a 94-98 rear bumper on order from the bay, will this fit the 93? My standard (cloverleaf?) alloys seem a bit dry and rough to the touch as if they have been acid cleaned. Are they supposed to laquered or is this normal. They don't have any gloss to them. Apart from the usual paranoia after buying a car, I'm pretty damn happy with my purchase and can't wait to start racking up some miles. First of all, welcome! your gonna have to slap some pics up! i love red mx's. maybe some Farcela G3 and G10 to get that red back up. Yep, the bumper will fit, all MX3 bumpers fit each other, 1.5, 1.6 or 1.8 anywhere between 91 to 98! The wheels usually have a very light gloss on them, nothing major. my standard were fairly minging as well. just get a nice second hand set somewhere and get them refurbed. makes them look brand new. you'll learn that we're all about the budget here, so any q's about where to buy parts etc, drop a post and we'll help you out. there is not much stuff on the web or otherwise for the mx3 unfortunately. Hi, and thanks for the info and welcome. Pictures will follow but I'd like to do a full 'detailing-world' style before/after format. At the moment she's getting a full going over with my Megs G220 and Sonus SFX polishes (1 to 3). This will be followed by Autoglum SRP, EGP and two fat layers of Collinite for that deeeeeeep gloss look. 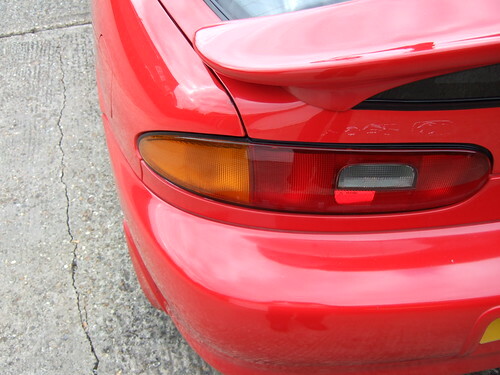 Thanks for the re-assurance on the bumper - I guessed that would be the case, but always nice to have it confirmed. She's had a respray at some stage on the passenger door and the overspray on the fore and aft wings is pretty faded so this will take some time to correct. 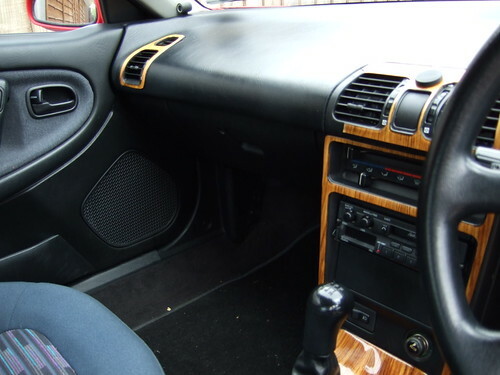 After peeling off the most minging fake wood veneer trim from the air vents and centre console, the interior is looking lovely now - no holes, rips tears or scuffs. Plus she comes with the original alarm and stereo, so she's pretty much standard. Despite the paint, she was still a bargain at £650!! with regards to your window seals. mine on the doors are gone. hard to find on scraps worth getting. and can only get new from mazda. for a grand sun of 300 and must be paid before they order from japan. following that with the others they are usually tacked down with some normal window sealent. Yes, it is the chips. I don't (yet) have a penchant for Emelyn Hughes style jumpers… but give it time! Should be taking some decent photos this weekend (if the sun comes out to play). Local indeed. I work in Cambridge, so you may see the mx round the airport in the future. 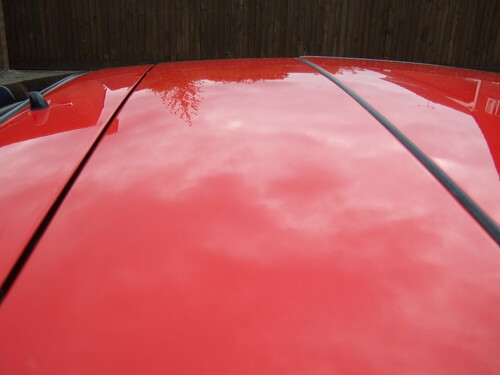 To be honest the standard paintwork comes up beautifully with very little work. The difficult bits so far have been the bumpers, the spoiler and the mirrors. They all seem to be made from different plastics, and respond differently to polishing. The mirrors have gone a horrible colour, so they are due to be re-sprayed (red or black??!? hmmm). The spoiler came up really well (eventually) and I've not spent that long on the bumpers as they are due to be changed (rear) and resprayed (front) anyway. 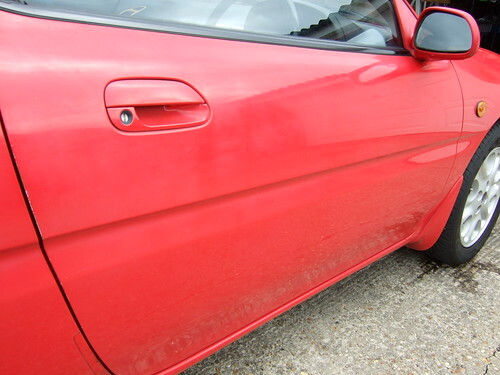 The passenger door had been resprayed at some point and this paint was as hard as nails, so didn't correct as nicely as the soft mazda paint. 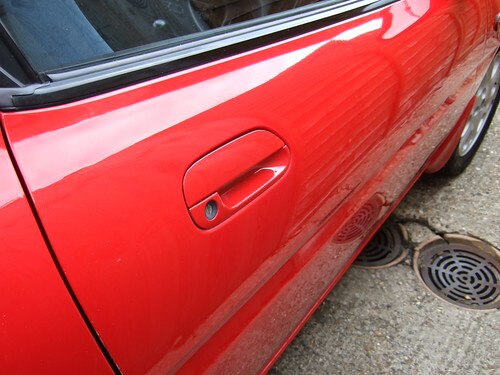 If you are lucky enough to have completely original paint, then full correction should only take a few (8-10) hours of effort. 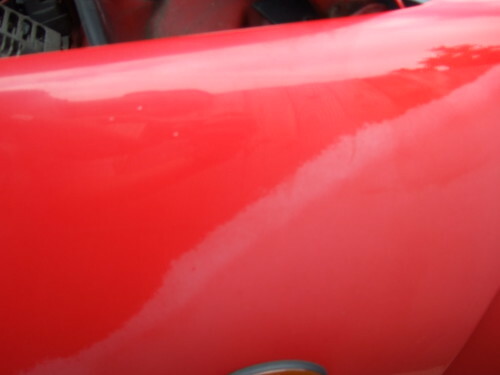 Well my paintowrk is almost beyond help… some mug did bad respray on some parts years ago, well before I had her, spoiler has worn through to white in patches, and very pale in others, sunroof faded, patchy fading on roof, bonnet wings and doors all fine, however lots of chips on bonnet, as for my bumpers... had a few chips, but used to come up beautifully, however in a moment of madness, allowed the poilish guys at Milton Tesco to clean while I shopped... they did a great job on the mrs' car, so trusted them... fooking power hose stripped paint clean off the bumpers... so they now look like red dalmation!!!! 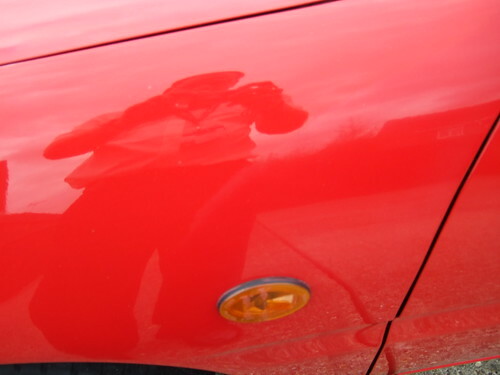 As for my mirrors, christ, looks like someone polished with paint thinner or something!!! 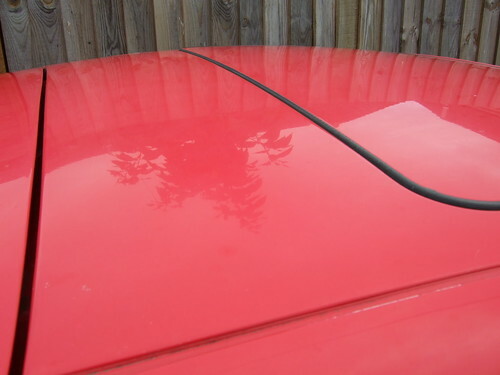 If I could afford respray, I would have whole thing blown over, but thats £300 I am not prepared to pay out right now. i have a set of red mirror covers if you want. in great nick. yours if u want them? Really? That would be cool. Do they clip on to the std mirrors, or are they replacement casings? I'd be happy to pay for them though (inc shipping). unfortunately they are the actual housings, so you'd have to take the mirror apart. but if you have patience its not hard!! ah your grand, just shipping and we'll leave it at that! and actually you seem to know quite a bit about polishing so if you PM me any info about a good polish/wax etc for the car and best methods, we'll consider that payment!! pringle lovers mirror back to marco?! :lol: something like that! I just need a passenger mirror housing, as some scrote bent mine directly downwards, so my car looks sad :( Don't care about what the paints like, as long as it's not limp and cracked! Managed to take a few 'after' photos yesterday after work. Hope these give some indication of what's possible with the right tools, and lots and lots of time …. Passenger Front Wing - Before (note overspray from previous door respray is fading at a different rate from the original paint). Passenger Front Wing - After (some fading, but an awful lot better). As you can see, she's coming up very nicely. Once I get the front bumper replaced (paint peeling) and new Number plates on, I'll post some longer range shots of her in all her glory. For those that are interested, I'll also do a 'how-to' guide on the cleaning and polishing processes.